Reed Tetzloff has been enthusiastically received as recitalist and concerto soloist on three continents, making his Lincoln Center debut with the Mannes Orchestra at Alice Tully Hall, and his New York solo recital debut at Merkin Hall, both in 2012. Since his orchestral debut with the Minnesota Orchestra at the age of fourteen, he has also performed concerti with such ensembles as the Cincinnati Symphony, the Lake Superior Chamber Orchestra, the Moscow Virtuosi Chamber Orchestra, the Queens Symphony, the Rochester Philharmonic, and the Tbilisi Symphony. He has won major prizes from several important international competitions: American Protege, Beijing International Music Festival and Academy, Bradshaw and Buono, Cincinnati World Piano Competition, Five Towns Music and Art Foundation, Schimmel, and the Tbilisi International Piano Competition. At Mannes College the New School for Music, he won the two largest awards available to pianists: the Concerto Competition and the Nadia Reisenberg Competition. 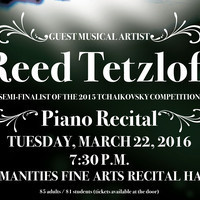 Tetzloff was hailed as "the Lyric Hero" of the 2015 Tchaikovsky competition, advancing to the semi-final round. He was honored as a winner of the Center for Musical Excellence (CME) International Grant, Birte Moller Young Artists Award, and joined the roster of CME Young Artists. His debut recording, “Sounds of Transcendence”, will be funded by CME, released commercially by Romeo Records, and distributed in the United States, United Kingdom, Germany, and Japan. This performance is co-sponsored by the UMM Music Discipline, the Campus Activities Council, and the Division of Humanities.